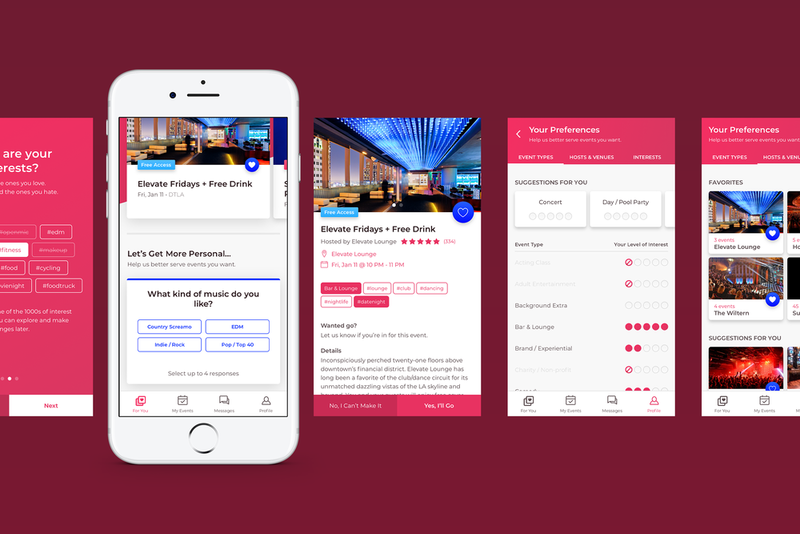 The Surkus mobile app connects members with brands and gives access to events and experiences tailored to their interests. My main objective was to make members feel like Surkus gets them and understands what they like. I wanted multiple ways to easily capture their preferences in an ongoing manner to help prioritize what events they see first and foremost when they open the app. The first touch point in getting a user’s preferences in events and interests is during the onboarding process. 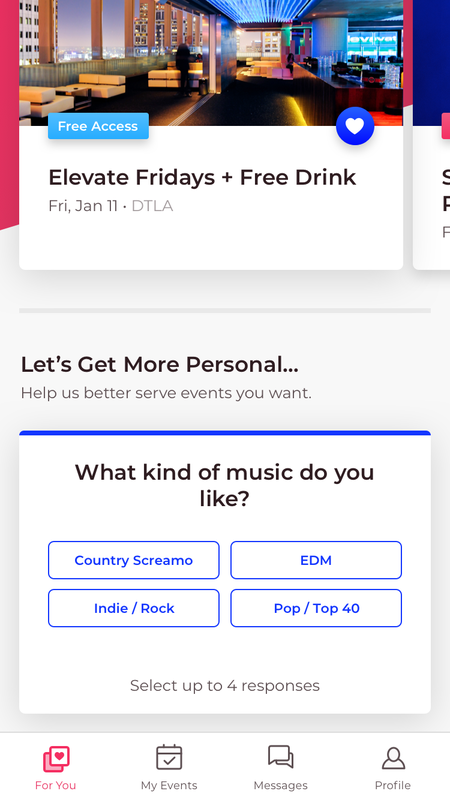 I wanted to emphasize that making their selections is important as it will personalize their app experience with curated events tailored to them. Adding a message that tells the user there’s a value proposition to making selections in that the app will better help them serve events they want. To increase engagement with the onboarding selections, I wanted to make the interaction dead simple for the user to not only select their likes but also deselect their dislikes, which is one of the goals of the challenge. On the home screen, there’s an existing questionnaire to gather more information about the user. One small change I made was adding the value proposition text that this will help the app to curate events tailored to them. Without it, users may not make the connection that it’ll affect their personal app experience or may assume that their responses are for consensus feedback to improve the app. Another addition I made was adding favoriting functionality to hosts and venues. This is a quick and upfront way of gathering the user’s hosts and venues preferences. They can update these preferences in the profile settings. Carrying over from the home screen, I added the favoriting feature here also. Ease of access for users to favorite their hosts and venues is what I wanted to achieve. I wanted to utilize these attributes in a more useful way, so I integrated selectable tags to the page akin to the onboarding tags. There are two benefits to this. One, they act as descriptors for the event. Two, they provide quick and upfront way of gathering the user’s interests. The user can update their interests in the preferences. I revamped the user preference interface by giving the user more control over their preferences and surfacing recommendations as part of an effort to incorporating more data capturing methods of the user’s likes and dislikes. For Event Types, the old binary like-dislike system has been replaced with a more granular interest level system. The user can set each event type based on a 5 point scale, 1 being “Hate it!” and 5 being “Love it!” This allows each event type to be weighted according to interest level and will be reflected on the home feed. 5-point event types will be shown much more frequently than 2-4 point types. 1 point types will not be shown at all. This is one of the main goals in Surkus trying to understand how much a user likes or dislikes particular events. In addition to the level of interest system, a suggestions module has been added. 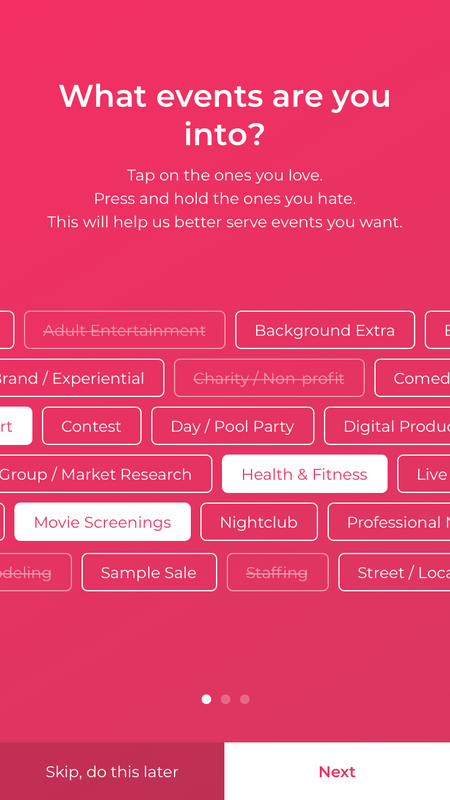 With 30 event types in total, this may seem daunting to the user to go through the list. 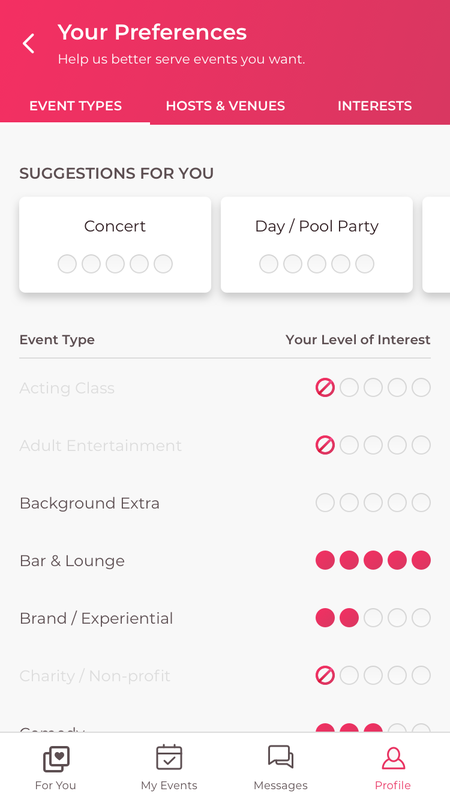 The suggestions module is a quick way for them to rate their interests, and the types that are surfaced are related to user’s set interested event types. This also allows for scalability if in the future more event types are added. User preferences is also the hub where users can view, manage, discover interests, hosts and venues. Favorited hosts and venues and liked interested tags (from onboarding and the event page) are all shown here. The suggestions module is also added here as another avenue to gather user data.